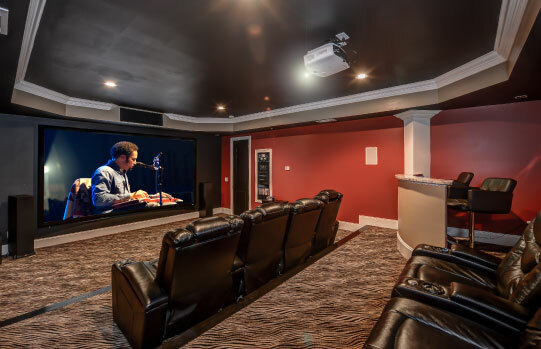 Service South can help you with your own custom home theater system in Atlanta, Brookhaven GA, Buckhead, Marietta, McDonough or Peachtree City. Home theater means you can experience commercial quality cinema in the privacy of your home. Service South will install your system and it will provide true cinema experience with right combination of electronics, acoustics, lighting and control. When it comes to home theater you want quality equipment such as the Wolf Cinema CD-6 projector. This projector delivers high-quality images. It boasts features such as 1080p performance from a next-generation TI DLP® chip set, advanced Wolf Cinema video processing, hand-calibrated color gamut and gamma curves, dynamic black level performance (15,000:1 CR) and much more. There are other important things to consider when you decide on a home theater system. You need to decide whether you want a dedicated theater room or a multi-purpose room. For example you could transform a den into a media room with powerful surround sound. Another important consideration is lighting. Do you want the lights on? Then you need a brighter projector and screen display. Proper sound control is also important, and you want to minimize the bounce affect. You may also want to consider sound proofing options to prevent sound from disturbing others. Cost is always part of the equation. You can get home theater systems for thousand or hundreds of thousands of dollars. Be sure you know your budget and work within that range. You can still get a great system for in the lower price range. You want easy control, proper lighting and superb sound. At the end of the day, you want to deal with the right contractor and installer. That way you will get a system that is properly designed, professionally installed and easy to use.